Christmas is a time when families love to get together to celebrate the birth of the Saviour. Family members who have been away from home make every effort to return and meet with their loved ones. What a great blessing it is for parents to have their children, some of whom are married with families of their own, gathered together at the table on Christmas Day. 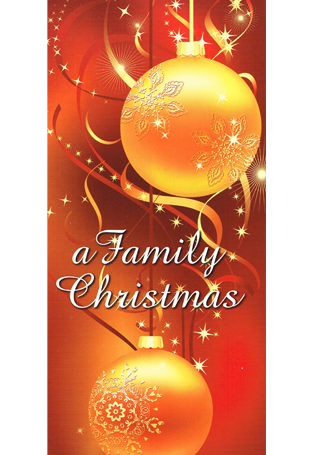 The whole Christmas season is centred around a particular family. Approximately two thousand years ago a man named Joseph and his wife Mary travelled from their home in Nazareth to register in a census in the city of Bethlehem. While they were there Mary gave birth to a baby boy. She had no idea that the birth of her Son, Jesus, would be celebrated throughout the world by countless people for many generations and that this family would be remembered each time people celebrated Christmas. The story of this family is recorded for us in the Scriptures. Mary was a young virgin who was engaged to be married to Joseph. One day the angel Gabriel appeared to her and informed her that she had been especially chosen by God to give birth to His Son. He told her that the conception of the child in her womb would be as a result of the intervention of the Holy Spirit. This young woman did not fully understand the implications of what might happen. However, she realised God had a personal interest in her as an individual, so she was prepared to trust Him concerning what was to come. Mary loved Joseph and planned to marry him. But now she was faced with a very difficult situation. How could she tell him that she had conceived a child? How would he respond? Would he cancel all the wedding plans? What about her parents? What about Joseph’s parents and family? How would they respond? What about all her friends? What would they think of her now? What about all the neighbours? Wouldn’t some people just love to spread gossip and scandal? However, none of these issues prevented Mary from submitting herself into God’s hands and trusting Him for the future. Her unconditional surrender to the Lord is summed up in her own words. She said, ‘Be it unto me according to thy word’.